One of the most interesting facts (for me, at least) that came out when Nicola Cortese left Southampton last year was that one of the changes that the former general manager had brought about during his time at the club was the personalised way in which the players travelled to away games. In particular, Southampton ensured that each player had his own personal mattress and each player slept on this mattress during their overnight stays in hotels for games away from the St Mary's Stadium. It was a move that echoed the strategy of marginal gains popularised by British cycling. Regardless of what class of hotel one stays at, there is always a level of discomfort after sleeping in a strange bed. Therefore, it makes logical sense that by sleeping on a familiar mattress will ensure that players wake up at least a few degrees more refreshed and rested than they would have otherwise. On its own it might not amount to a telling advantage but it undoubtedly provided a fractional benefit. Build in enough of these and success becomes all the more likely. That Southampton had opted to target their players' sleep is in itself highly interesting. Other sports have long realised the import role that sleep plays in ensuring that athletes can perform at peak levels. One of the key aspects of Kenyan long distance runners – who many within athletics have examined in detail in order to identify the source of their success – is the amount of time which they spend resting. Adhanard Finn, who spent a year in Kenya training with some of the world’s elite athletes and who wrote the excellent book Running with the Kenyans, details how most of their day is spent resting. This allows the body to recover from the strain that it is put under during the training phase. In football, questions about sleep usually arise during major football tournaments like the World Cup when the debate as to whether wives (and girlfriends) should be allowed to stay with the players invariably kicks-off. This, however, only relates indirectly to the quality and amount of sleep that players would end up getting if they were allowed to stay with their wives. In Italy, teams going through particularly bad periods tend to go to what is called a ‘ritiro’ that usually is a period of time (typically a week) holed up in a hotel (usually in a remote area) with the aim of getting the players to focus exclusively on football. This is normally meant as a punishment and a warning to the players but it probably have the indirect effect of forcing them to rest more than they normally would for the simple reason that there isn’t anything else for them to do other than rest. In 1996 Tom Reilly (the first Professor of Sports Science in the United Kingdom) of the Liverpool John Moores University wrote a paper titled “Energetics of high-intensity exercise (soccer) with particular reference to fatigue”. It is a fascinating paper which is very much visionary. One of the conclusions that Professor Reilly reached was that “a team with the superior tactical ability can dictate the pace of the game so that the performance capabilities of outfield players are not overtaxed.” Essentially, this was what Rijkaard and (in particular) Guardiola’s Barcelona did – and what many others have since replicated – which is the concept of resting whilst on the ball, moving it around and seemingly toying with the opposition. The main aim of that tactic was that of keeping the ball whilst waiting for the opposition to make a mistake but a secondary benefit was that it allowed Barcelona to dictate the rhythm of play: it ensured that their players didn’t overtax themselves physically. Yet, despite acknowledging that football, due to the dribbling element, has a higher energy cost than normal running, sleep was not identified by Professor Reilly as a possible strategy to combat fatigue. Indeed, his focus was more on the kind of training players received (his recommendation was for greater aerobic training) and what kind of diet they had. What this research did was to test a player’s ESS and then look three years later to confirm whether he was still playing at that level. It found is that there seems to be a linear correlation between the ESS score and that player’s permanence in the league. For instance 72 percent of players with a baseline ESS score of 5 were still in the league at the follow-up point, compared with only 39 percent of players with an ESS score of 10 and 14 percent of players with an ESS score of 15. 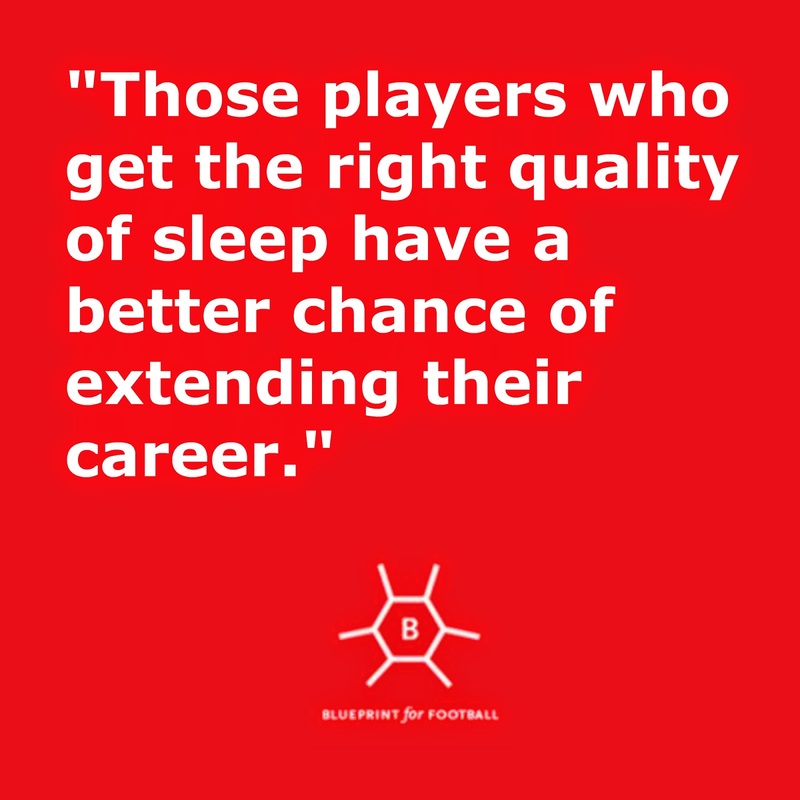 Essentially, those players who get the right quality of sleep have a better chance of extending their career. Another example is that found in the paper titled “Intermittent-sprint performance and muscle glycogen after 30 hours of sleep deprivation” (M. Skein, R. Duffield, J. Edge, MJ. Short, T. Mündel). These tested ten male athletes’ performance before and after depriving them of sleep and found that this resulted in reduced sprint performance and slowed pacing. Interestingly, in another piece of research carried out in 2009 (Effects of sleep deprivation on cardiorespiratory functions of the runners and volleyball players during rest and exercise by O. Azboy O1 and Z Kaygisiz) found that lack of sleep has a greater impact on volleyball players than it has on runners. This is interesting as it could be down to the fact that a volleyball player has more decisions to make than a runner (where to aim, avoiding team-mates, not going for balls that are going out and so on). All this increases the burden on coaches to ensure that their players get enough sleep (and the correct quality of sleep). This is becoming all the more difficult given that the last thing that most people tend to do before switching off to sleep is look at their smartphone or tablet with research showing that this reduces the quality of sleep one gets. Cutting out this habit would be a good start. Other strategies include going to bed earlier and trying to include naps during the day. Realistically, however, these are not possible for many people so the best option would be for people to monitor their sleep. There are many devices and apps that help in this respect and the basic principle is that of recording what one did before going to sleep, measuring the quality of that sleep through a device or app and then evaluating the levels of fatigue felt during the day. Once there is enough data, it will be possible for that individual to evaluate which actions allow him to get the best quality of sleep and determine how doing so helped in his energy levels. Ultimately, however, all that most coaches can try to do is to educate. 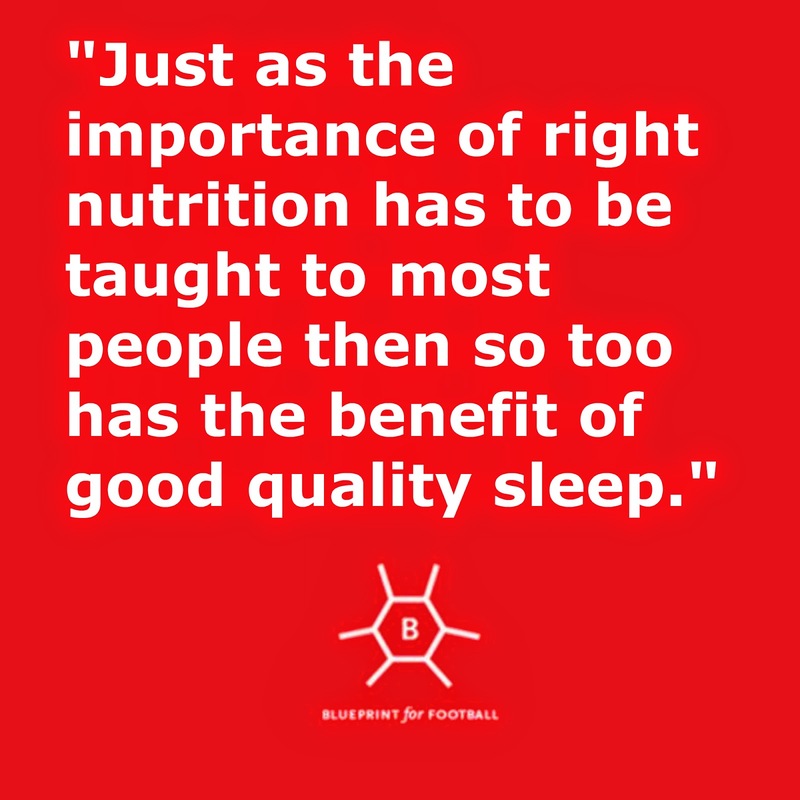 Just as the importance of right nutrition has to be taught to most people – and indeed started really being given importance in top level football in England when foreign coaches started to arrive in the late nineties – then so too has the benefit of good quality sleep. *It was not possible for me to verify whether this research has been peer reviewed. If you enjoyed this article then you'll probably also like Blueprint for Football Extra, our newsletter that includes a weekly digest of the articles, interviews with football coaches and the best coaching articles on the internet. And it is all free. Join here.